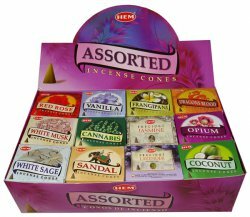 Best Selling HEM incense cones in display box. Includes 48 assorted packs of the most popular types. EXTRA DISCOUNTS FOR TWO OR MORE DISPLAYS.